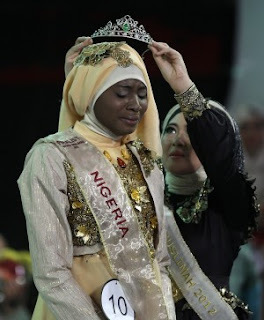 A Nigerian, Obabiyi Aisha Ajibola, tearfully prayed and recited Koranic verses as she won a world beauty pageant exclusively for Muslim women in the Indonesian capital Wednesday, a riposte to the Miss World contest that has sparked hardline anger. Muslimah World, strolling up and down a catwalk in elaborately embroidered dresses and stilettos. Aisha received 25 million rupiah ($2,200) and trips to Mecca and India as prizes.